First things first. The winner of the Anolon Cookware Giveaway is Amber! Amber, please check your email and respond, congrats! I like to play this game when watching re-runs of old NBC shows, preferably ER and The West Wing. But first, let me state a little unknown fact before explaining the rules to my game. Fact…ER and The West Wing are seriously the best shows ever made for prime time TV and I long for similar shows to reappear on nightly TV. The world needs a President Bartlet and a CJ Craig and who doesn’t fall in love with Mark Green or Nurse Hathaway? Am I the only one pining for the nights that didn’t include a competition of sorts and total judgement of strangers? But anyway, the game that I like to play is naming the shows that the actors have appeared in post the good days of TV. For the record, every single actor from the late 90’s was once a crack head of a patient on ER, head of the FBI on The West Wing, and eventually a crazed madmen on Grey’s Anatomy. And if you have ever watched Friday Night Lights…nearly 3/4 of the cast has been, one time or another, on Grey’s Anatomy where they most likely have kicked the bucket. 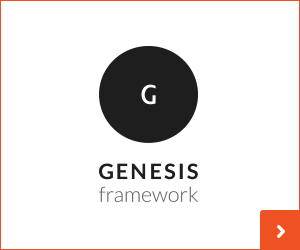 It is a game that I am sure will prevent Alzheimer’s disease from ever setting in… a brain teaser of sorts. Another game I like to play but one that I am sure will not prevent Alzheimer’s disease is … what can I slather apple butter on? The answer, it is, come to find out is…anything and everything that moves slower than myself. 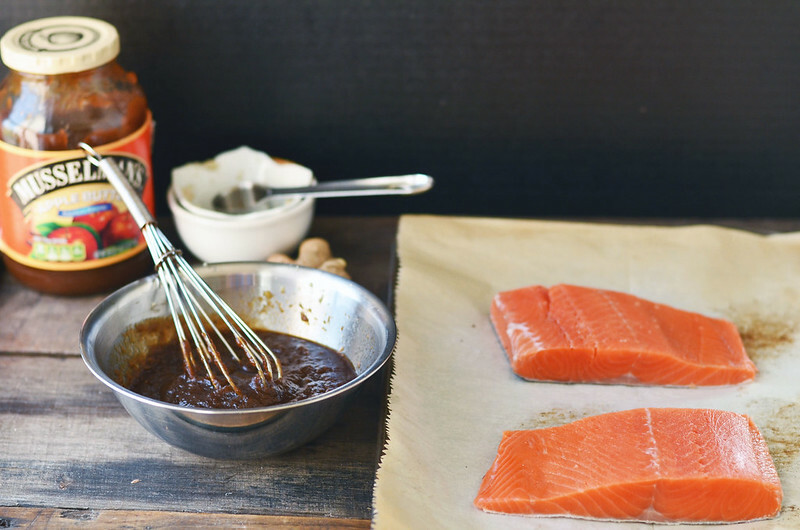 Musselman’s – the makers of some of the most delicious apple butter this side of the Pacific Ocean, offered me the chance to coat salmon with this nectar from the apple gods and well, I couldn’t resist. They graciously provided me with a jar of apple butter, that I ate by the spoonful as I checked the rest of the mail the day it arrived on my front porch, however the opinions are all my own. As is the remainder of the jar – it is ALL MINE! 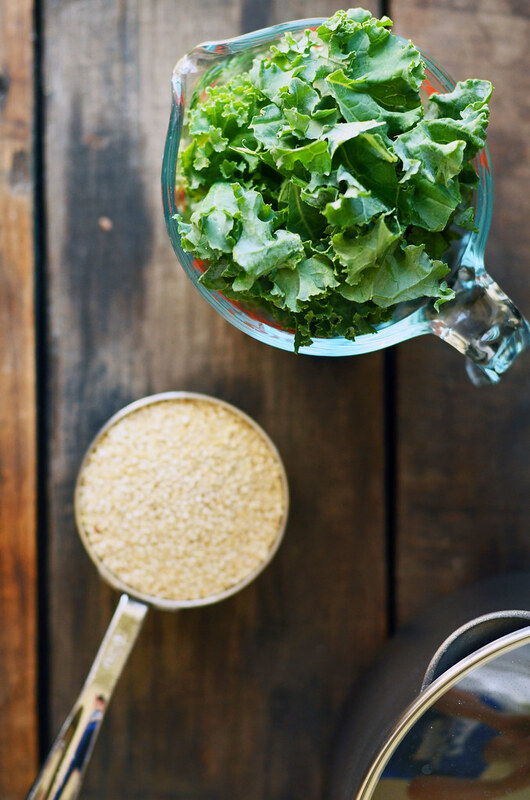 But first..we have to make a bit of kale quinoa. We will make the mound of quinoa and kale for the salmon to lay upon. To nestle into. It is a one pot deal. Also, add some chicken stock or broth into this picture. Or water. Use what you have. There is gonna be some boiling. 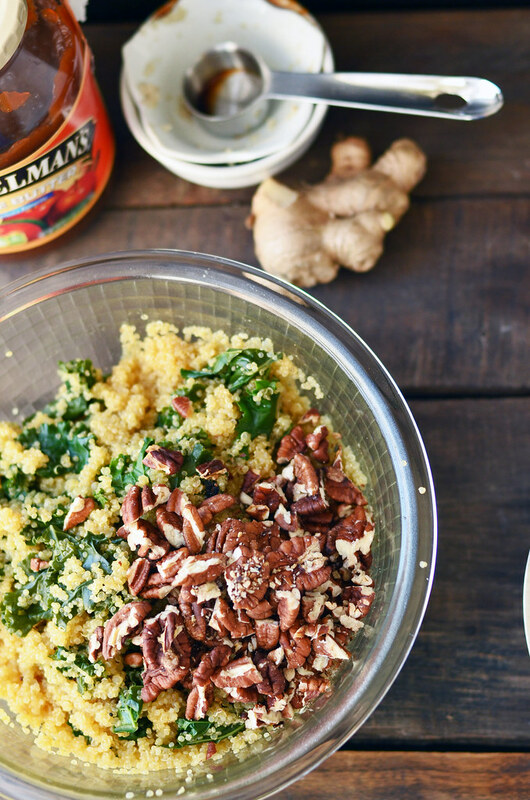 Adding of quinoa. Some simmering. Stuffing of kale. More simmering. And then resting. 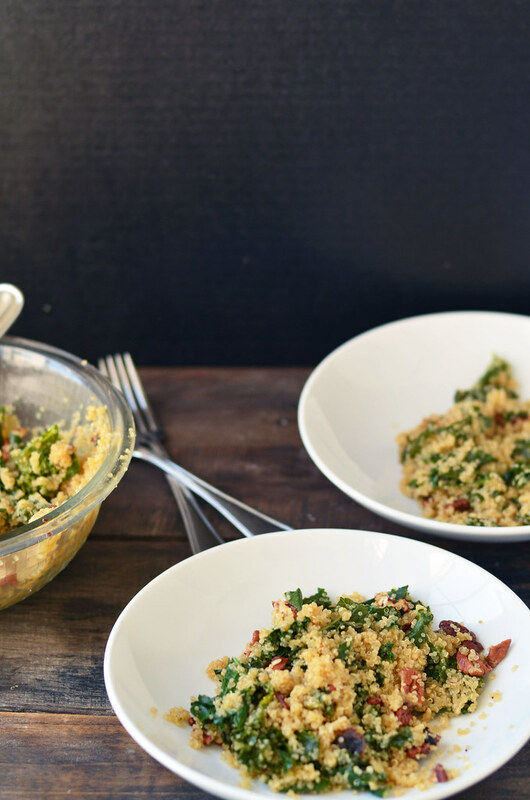 This can be made even speedier if you have a bit of leftover of either kale, quinoa, or both in the fridge from a dinner earlier this week. 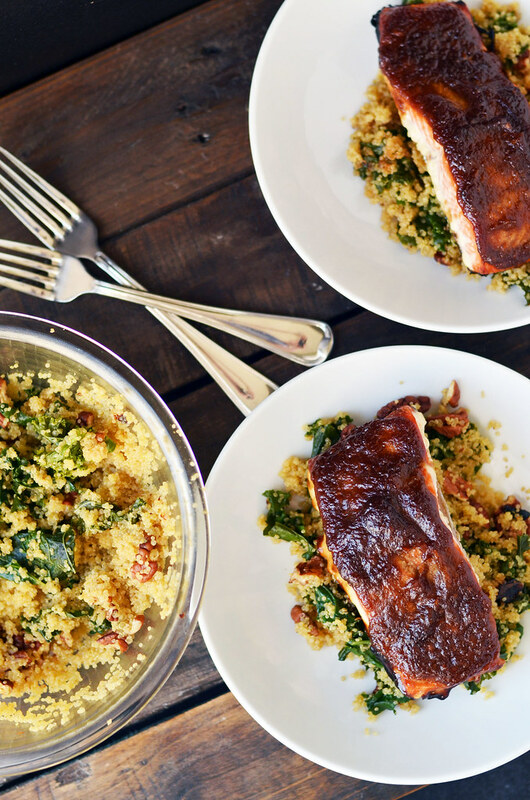 While the kale and quinoa are becoming fast friends, we turn our attentions to the salmon. 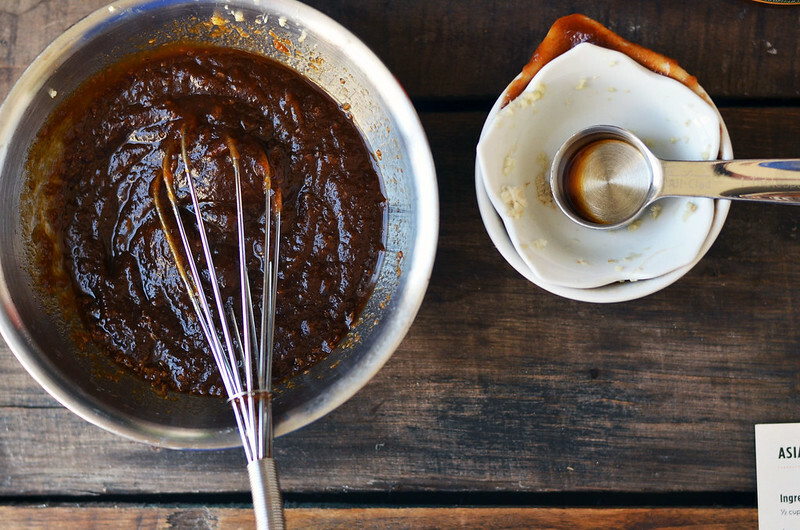 A quick glaze needs whisked together first. 5 ingredients. Well, 4 if you are a dope like me and forgot the scallions or green onions. But 5 if you are a rock star. Grated ginger and garlic. Soy sauce for some serious saltiness. 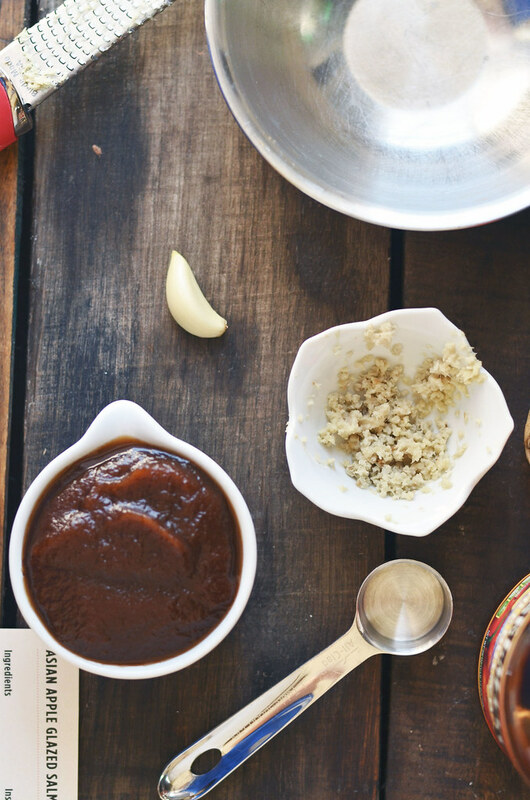 Apple butter for the win and sweetness. Imagine that there are bits and pieces of green scallion in the picture above. This is enough for about 4 salmon filets. Or two with the hopes of more in the coming week. 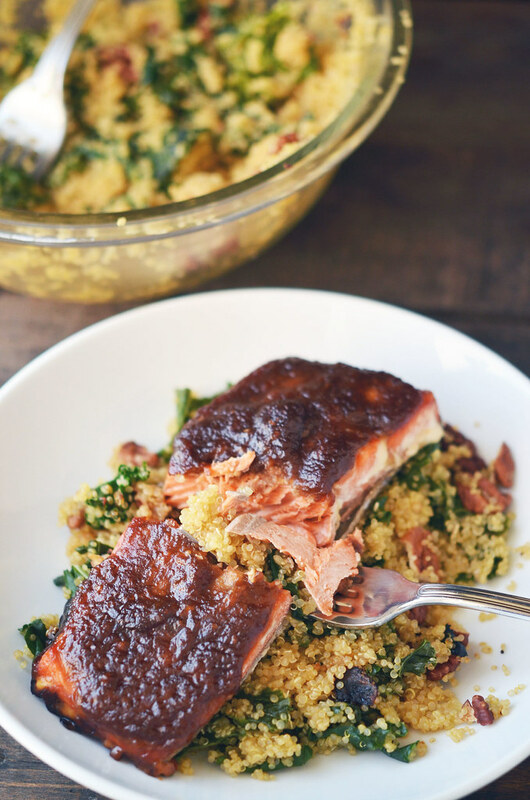 Salmon goes skin down on a foil or parchment covered baking sheet. 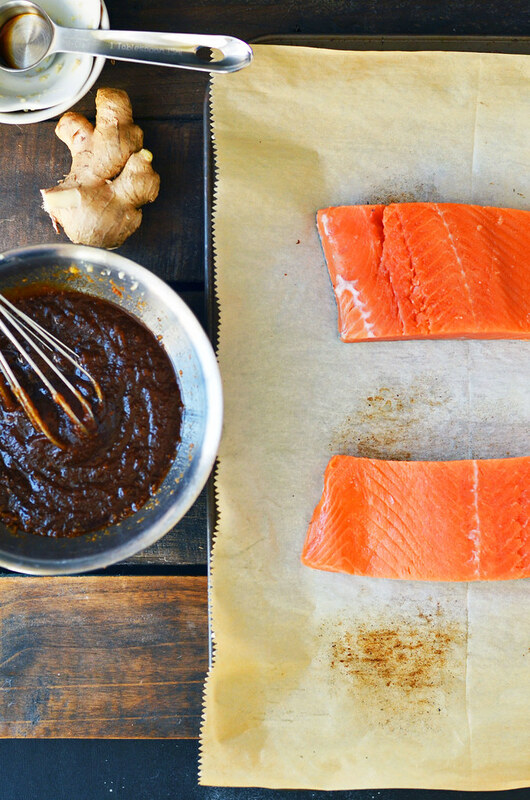 Try to find even sized pieces of salmon so they have similar cooking times. A good coating seems so right and so good. Salmon will meet the oven at about 400F. 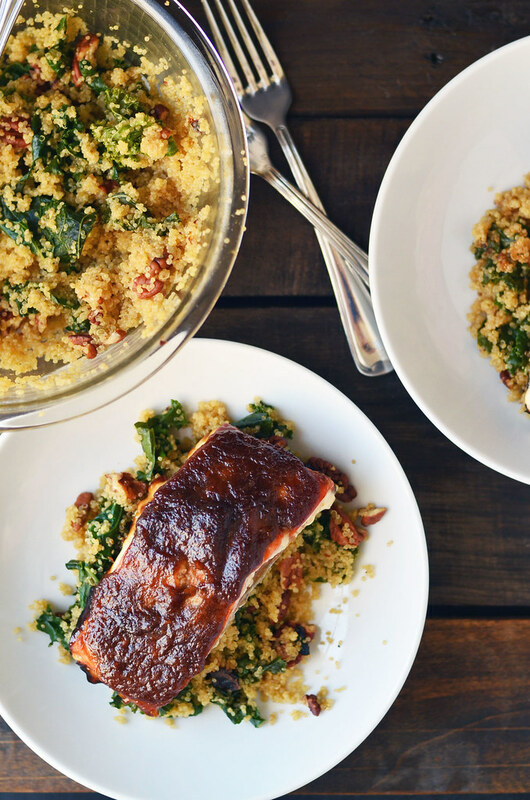 Salmon goes atop the bed of kale quinoa. And dinner is served and one more way to enjoy apple butter is in the books. For dessert…can we slather it on saltines and drink hot coffee and call it a day? and watch The West Wing and hope and wish that Josh and Donna can just finally confess to being in love? Can we, please? Preheat oven to 400F. Line a baking sheet with foil or parchment paper. Set aside. In a medium saucepan, bring chicken broth to a boil. Add quinoa and cover. Reduce temperature to a simmer and let simmer for 10 minutes. 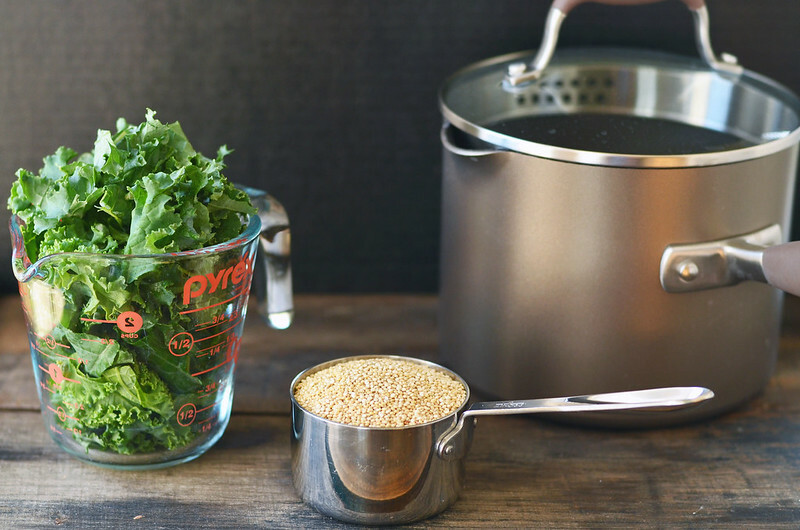 After 10 minutes, add kale to saucepan and continue to simmer for an additional 5 to 10 minutes until the broth is absorbed. Let sit for 5 minutes covered and then fluff with a fork. Add pecans and scallions and toss to combine. Add salt and pepper to taste. 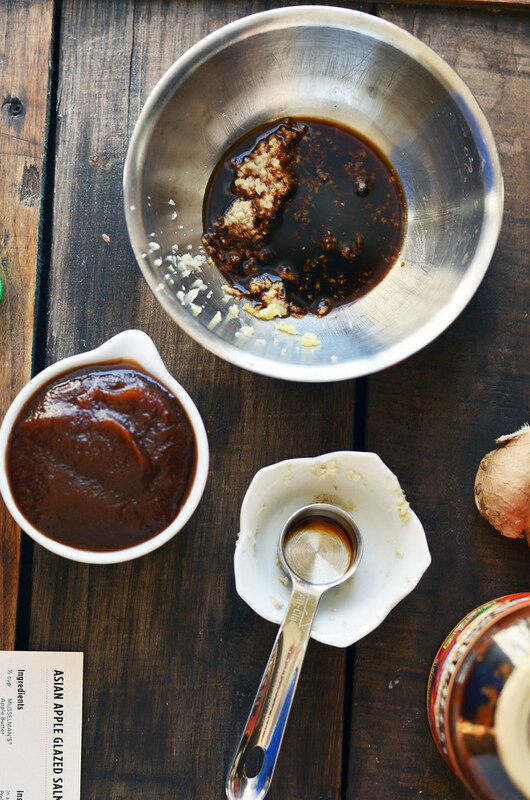 While the quinoa is cooking....In a small bowl, combine apple butter, ginger, soy sauce, and garlic. Stir to combine well. Place salmon fillets, skin side down, on prepared baking sheet. 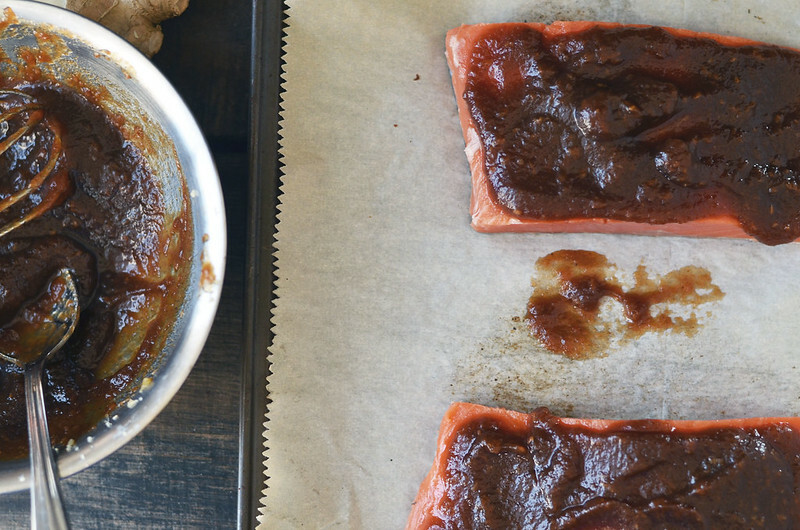 Generously glaze each fillet with apple butter glaze - about 2 tablespoons per fillet. Loosely cover salmon with foil and place in preheated oven and bake for 10 minutes. Remove foil and continue to bake for an additional 5 to 10 minutes or until fish is flakey and cooked through. 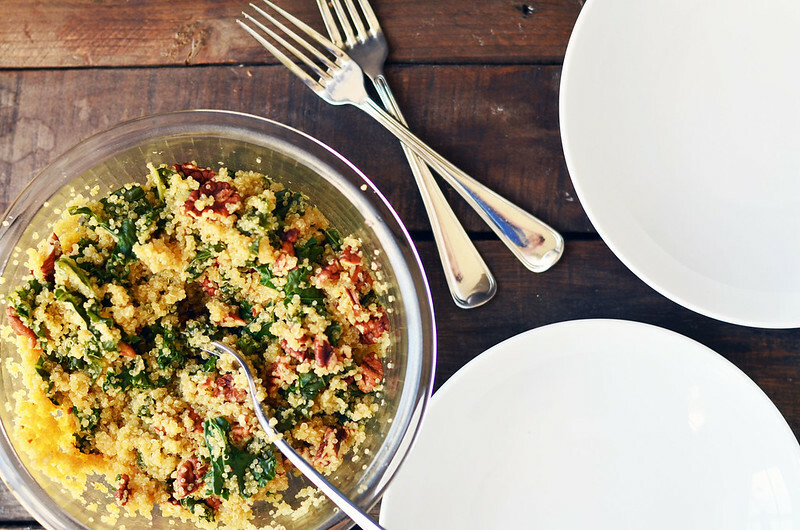 To serve, place about a cup of kale quinoa on plate. 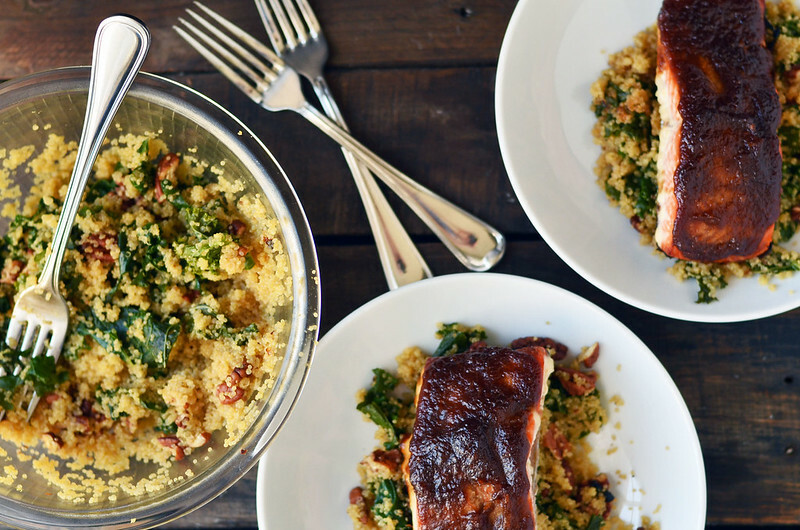 Nestle a salmon fillet into bed of kale quinoa. Sprinkle with chopped green onions and serve immediately.